PCB and Steel industries need a high temperature label for each product; our high temperature Polyimide Labels (350C) is just the solution. The white coated surface on Polyimide Labels (350C) (Dupont Kapton) is suitable for UV printing and thermal transfer ribbon printing. 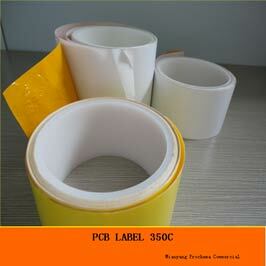 The Polyimide Labels (350C) allow the label a very high working temperature up to 350C.